I always liked the 3 border colors in the Developer Dashboard in SharePoint 2010 but it doesn’t exists anymore in SharePoint 2013. Anyway so what did Microsoft added to the Developer Dashboard in SharePoint 2013? SPRequests in separate tab to easily diagnose leaked SP Requests. I think the reason they removed the colors, is that it opens in a new window, may be, but even though it can still exists in new window if they want to. SharePoint 2013 CSOM in managed code – Where is the “Current” in the client context!? This was a question I posted in the SharePoint Community as I was investigating around SP APIs and came to try CSOM, to see what’s there and what not. Just at the start of utilizing CSOM and as anyone I am trying to call property “Current” for the web application instead of writing the Web Full URL which is a vvvvvv basic thing. I looked here http://msdn.microsoft.com/en-us/library/microsoft.sharepoint.client in this Namespace: Microsoft.SharePoint.Client to find “Current” property, but nothing. And looked for the namespace Microsoft.SharePoint.Client.Silverlight for Silverlight here http://msdn.microsoft.com/en-us/library/sharepoint/microsoft.sharepoint.client.clientcontext.aspx and it does have the “Current” property. Does this means only for Silverlight web parts or what exactly? So my question to confirm with anyone was… is “Current” property really doesn’t exists in CSOM in managed code!? Below was the reply; I am not going to write it but rather took screen shot to read it as is; but I highlighted the important parts where he confirms it doesn’t exists in CSOM, then he explains the reason, deep dive details in the background where everyone needs to understand.. 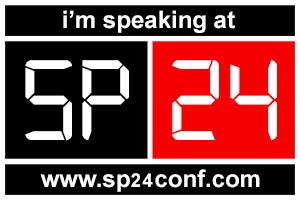 The coming SharePoint Conference are quite interesting, in different countries, you don’t want to miss at least 1 or 2 of it.